Atlantis office offers a wide selection of leather office chairs. Whether you are looking for a traditional leather office chair or a contemporary leather office chair, we have a great selection for you to view. Leather office chairs provide an executive look and feel and are a fantastic addition to any office or home office setup. Leather office chairs provide comfort and support any user. Leather office chairs are available in many styles including, posture, operator, heavy duty, executive, ergonomic amongst others. We provide, bonded leather office chairs, leather faced office chairs and top grain leather office chairs, including some Italian leather office chairs. A variety of leather finishes available with a selection of office chair bases to suit your tastes. 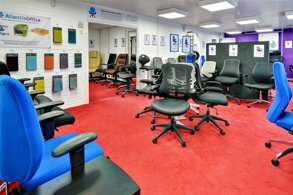 We also provide a range to suit your budget, from economy leather office chairs to top grain executive leather office chairs. Our leather office chairs have various features such as adjustable headrests, seats, backs and arms, tilt and lock mechanisms and built in lumbar back support.  Blyth Leather visitor chair is Atlantis Office solutions to the budget visitor chair, this cha..
Blyth Leather office chair is Atlantis Office solutions to the budget executive chair, this ch.. The Brooklyn is a modern chair designed for both look and comfort. The Brooklyn is ergonomically sh..
Black Leather Office ChairHigh Back Executive Managers ChairBlack Bonded LeatherDurable Nylon BaseEa.. The Bella is our medium back, black bonded leather executive office chair. Suitable for any executiv.. Contemporary visitor chair, perfect for receptions, meeting areas and boardrooms. Smart polished.. The Daytona is both stylish and comfortable, with its padded soft faux leather and mesh back and se.. The Langham chair is our black bonded leather faced executive chair, it is ideal for daily office u.. The Langham Visitor chair is our bonded leather faced visitor chair in black. The Langham offers fix.. The Lazio is our black bonded leather visitor chair, ideal for use in boardrooms, meeting rooms and .. The Essen is ideal for use in any multi seating environments. The chair is made from a smoothly sha.. 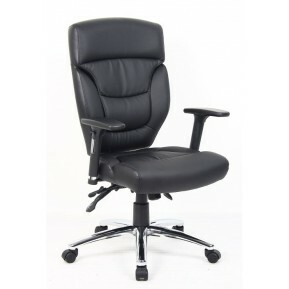 Medium Back Operator Chair Black Leather Look Height Adjustable Arms Height Adjustabl.. The Dartford Executive Leather Office Chair is the ideal solution if you are looking for a stunning ..
Hague Black Leather Look Cantilever Chair Smart, encouraging and comfortable chairsClassic styl..
Harley Leather Office Chair Available in Black Soft Feel Bonded Leather Large Padded seat and ..
Harley Leather Cantilever Chair Available in Black Soft Feel Bonded Leather Large Padded seat ..
Cavalier Cantilever Leather High Back Office Chair Designed High Back Leather Cantilever Chair ..
Eccles Leather Visitor Cantilever Stackable Office ChairThis Sleek deign meeting chair is .. The Havanna Boardroom Chair is our Black Bonded Leather Boardroom Chair. It is suitable for 8 hour u.. The Practica Chair is ideal for use in industrial environments, it features a wipe clean black .. The Canasta II chair is a stylish high back, leather executive office chair. It has a lock tilt mec.. 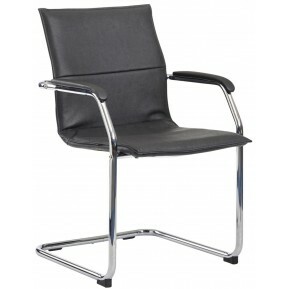 The Milan Leather is an executive armchair with stitching detail, stylish chrome base and dura.. The Canasta visitor chair is perfect for receptions and meeting rooms. Upholstered In a stylish bla.. The Thrift offers contemporary styling at an affordable price. This chair comes in Black Bonded Leat..
Black Leather Office Chair Leather faced executive chair with ruched upholstery Chrome ba.. The Carter is our high back executive leather office chair. 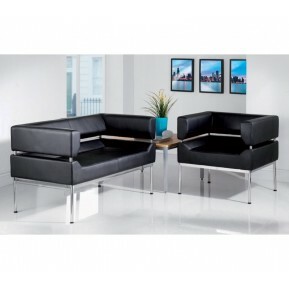 It features black faux leather upholster.. Featuring a beautifully designed leather back and seat perfectly complimented by a chrome frame an..
Classically Italian inspired executive armchair Curved seat and back for comfort Chrome detailing on..
Classic Italian styling Faux leather black upholstery Figure hugging upholstery pads Chrome arms and..
King Black Leather Executive Office Chair 2 Year Warranty on all moving parts Stylish le.. When it comes to style and design the Talladega Racing Chair is in first place. This modern racing ..
Leather faced executive black office chairGas lift seat height adjustmentReclining function with til.. The Noble has been designed with comfort in mind, it is ideal for any reception area or meeting room.. The Plaza Office Chair is a traditional yet stylish option, with an integrated headrest, contour lin..
Nantwich Black Leather Faced Managers Office Chair Soft padded black arms Black nylon 5 .. The Parker is an elegant, modern chair designed to reach maximum chair potential in a sleek black F.. The Ashford Leather Office Chair is our generously padded leather office chair. The Ashford features.. The Grantham High Back Leather Chair is our high back, black bonded leather executive with white de.. The Photon is our black bonded leather executive chair ideal for use in both home and commercial off..
Somerset leather Executive Office / Home Furniture Chair Stylish bonded lea..
Retro style visitors chair upholstered in faux leather Available in Black, Red or White leather ..
Black Leather faced, cushioned visitors chair. Ideal for receptions, meeting areas and boardrooms..
STOCK DUE MID MAY 2019 Hartford is our latest design with its sleek ripple effect, stylish chrome f.. The Exeter is our soft touch leather office chair, it is available in a choice of 3 colours (White, .. The Ergo Comfort Air is our ergonomic high back operator office chair, suitable for use in any offic.. The Penrith Leather Executive Office Chair features an extra deep, soft touch contoured seat and bac..
Palermo Leather Faced Executive High Back Chair Contemporary Design Stylish Arms with Silver ..